Rack up the profits! Show off six favorites in your store with a Jumbo Mini Bin Display Rack. Sturdy and stylish black metal frame brings the durability that you need in your candy displays. Ideal for impulse candies. Place this rack on the counter as a wonderful POP display for wrapped candy. 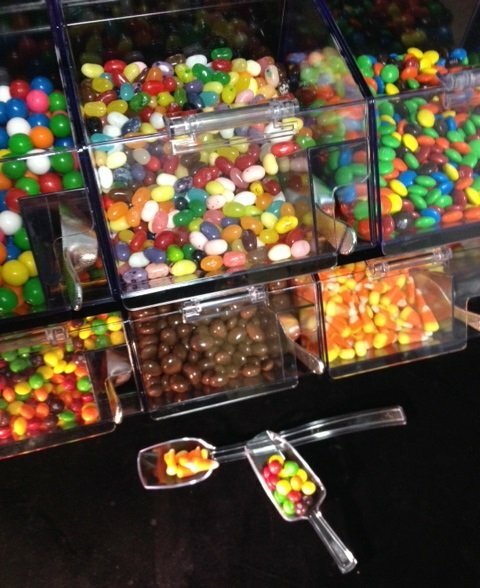 Fill it with bulk candy and other selections in your yogurt shop for an incredible yogurt toppings bar. Six bins and scoops are included to make this an easy way to start, or add to, your wholesale candy sales. Why wait to potentially increase your profits? 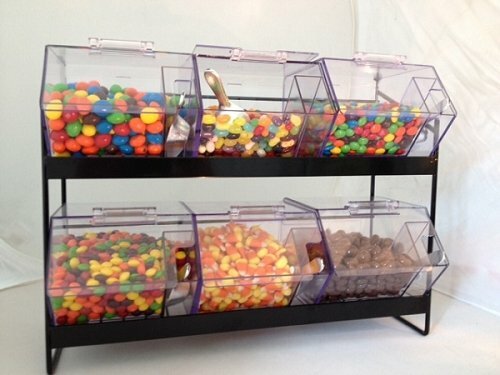 Order this jumbo mini candy rack today! Thickness Is A Little Over 1/16"
Only Want the Candy Bins- Get them HERE! These bins were absolutely perfect for what I needed. I have a smoothie bar and we have powdered additions to add to the shakes and these were the perfect size to put them in. Ordering and shipping were easy and efficient.